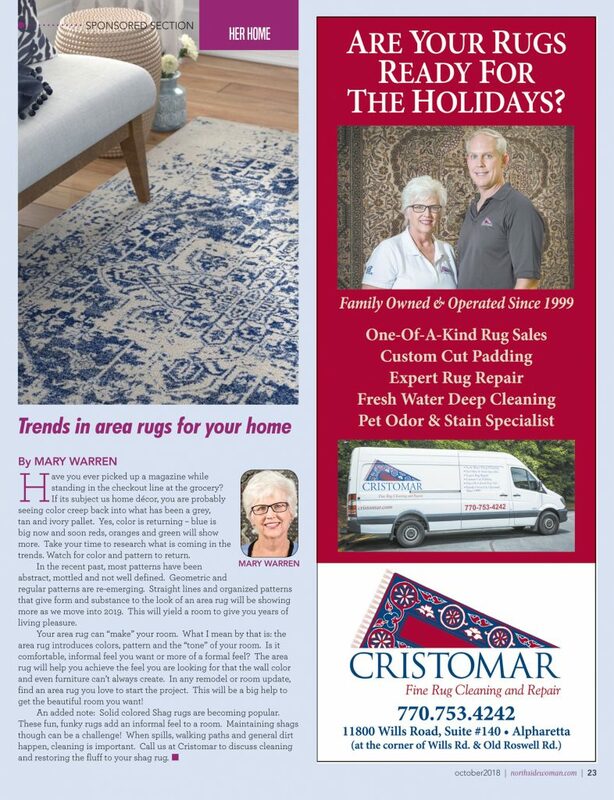 This is a sponsored news article, from “NSW” (Northside Woman Magazine), published (October, 2018) by Appen Media Group, Alpharetta, GA; with an article on “Trends in area rugs for your home”. Have you ever picked up a magazine while standing in the checkout line at the grocery? If its subject us home décor, you are probably seeing color creep back into what has been a grey, tan and ivory pallet. Yes, color is returning – blue is big now and soon reds, oranges and green will show more. Take your time to research what is coming in the trends. Watch for color and pattern to return. In the recent past, most patterns have been abstract, mottled and not well defined. Geometric and regular patterns are re-emerging. Straight lines and organized patterns that give form and substance to the look of an area rug will be showing more as we move into 2019. This will yield a room to give you years of living pleasure. Your area rug can “make” your room. What I mean by that is: the area rug introduces colors, pattern and the “tone” of your room. Is it comfortable, informal feel you want or more of a formal feel? The area rug will help you achieve the feel you are looking for that the wall color and even furniture can’t always create. In any remodel or room update, find an area rug you love to start the project. This will be a big help to get the beautiful room you want! An added note: Solid colored Shag rugs are becoming popular. These fun, funky rugs add an informal feel to a room. Maintaining shags though can be a challenge! When spills, walking paths and general dirt happen, cleaning is important. To contact Cristomar, you can use the “Contact Us” Tab and scroll down to “Drop Us a Note”; or call: 770-753-4242. We look forward to hearing from you so we can discuss the professional care for your antique, oriental or new area rugs. You can also visit our online Rug Shop, to see a selection of consignment rugs.